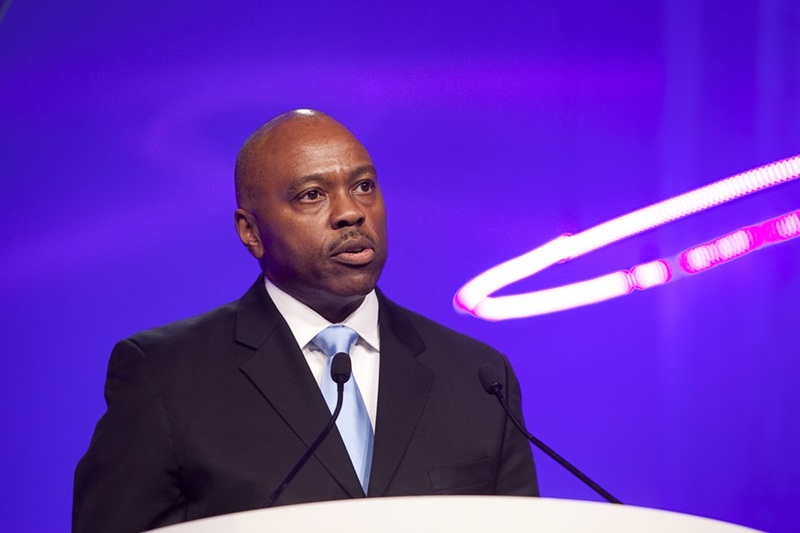 APTA's 2014 Annual Meeting & EXPO in Houston featured more than 12,000 attendees from 65 countries, including a record-breaking 800 exhibitors and more than 80 sessions. "I believe we've lived up to the adage that everything is bigger in Texas," said APTA President & CEO Michael Melaniphy (left) at the opening general session on Oct. 13. Melaniphy delivered rem arks and welcomed a lineup of session speakers that included Annise D. Parker, mayor, city of Houston; Thomas C. Lambert, chief executive officer, Metropolitan Transit Authority of Harris County (Houston, TX); and Gilbert Garcia, chairman, Houston METRO. APTA Chair Phillip A. Washington (right), general manager, Regional Transportation District (Denver, CO), thanked everyone for "entrusting me with the great honor of being your chief transportation advocate." Outgoing Chair Peter Varga, chief executive officer, The Rapid (Grand Rapids, MI), said he would continue to push for a long-term federal surface transportation reauthorization bill. 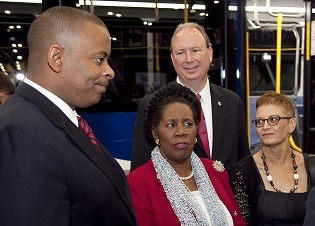 DOT Secretary Anthony Foxx spoke at a session Oct. 14 about the Obama administration's GROW AMERICA Act, as well as the future of public transportation in America, and toured the EXPO floors, along with (left to right) Rep. Sheila Jackson Lee (D-TX), Melaniphy, and acting FTA Administrator Therese McMillan. "We have a responsibility collectively to remind this country, when the wheels of transportation grind to a halt, so does its economy," Foxx said. Foxx's speech was followed by a roundtable with four mayors: Chris Coleman (St. Paul, MN), Chris Koos (Normal, IL), Frank Jackson (Cleveland, OH), and Parker. See the Oct. 27 Passenger Transport for full coverage of the Annual Meeting & EXPO. The trend of Millennials toward public transit and away from driving is permanent, according to a new report from the United States Public Interest Research Group. Young people's mobility habits are changing for good in response to socioeconomic shifts, lifestyle preferences, and changing technology, the report states. Mark your schedules for APTA's 2015 major meetings and conferences! Dates are set for everything from the Transit CEOs Seminar to the Bus & Paratransit Conference and the Annual Meeting. Public transit serves as a key to economic opportunity. More accessible public transportation means more job opportunities. Los Angeles is envisioning on-demand public transit.